The Chromebook has quickly moved into prominent discussions among educators as a flexible Internet-based device in classrooms. Whether you are using the system as a cart or taking advantage of 10-second start-up times or optimizing it as a low-cost 1:1 device for utilizing Google Apps, the Chromebook is now a computer that schools must consider. Over the past year, several manufacturers have come into the marketplace, including Samsung, Acer, Lenovo, and HP. 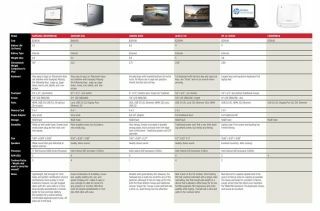 Since Chromebook’s operating system is the same across all of these platforms, we thought it would be interesting to take each model for a test drive and look at what makes them unique. We compared them and provided the following table to take a closer look at the key features within the devices. One of the often forgotten devices when thinking about Chromebook is the Chromebox. It is a powerful device for those wanting to connect directly to the cloud with a full keyboard, mouse, and large screens. The new addition of the kiosk mode within ChromeOS makes this a great tool for public locations like meeting rooms, library card catalogs, registration desks, or check-in locations. It is a “setup and forget it” device because it automatically updates itself. It can also be used as a desktop replacement device with a dual-display port that can be displayed on two extended monitors. With six USB 2.0 ports, you can plug in everything you might need at a desk and go to work.